It’s like being inside a cloud. The air of the rehearsal room is thick with stage fog, shot through with flickering beams of yellowish light. 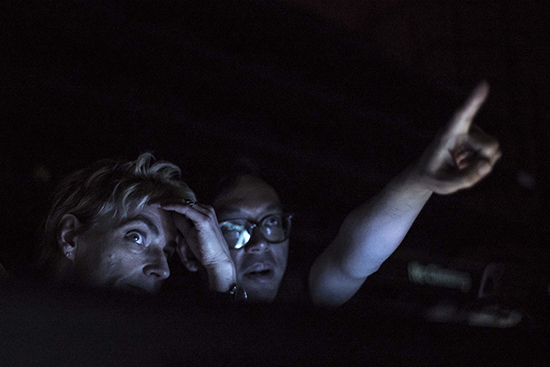 Choreographer Anouk van Dijk and multimedia artist Ho Tzu Nyen stand near the door, peering into the roiling dimness, watching as dancers fade, vanish and then reappear. This is day two of rehearsals for ANTI—GRAVITY, a new work presented by Chunky Move and Malthouse Theatre for the Dance Massive and Asia TOPA festivals. And clouds are indeed the theme. The work explores associative links between cloudiness and classical ideas about dancing. Both clouds and dancers can—in manifold ways—be symbolic of lightness and transcendence, and all things rising above and beyond. The remoteness of clouds—their loneliness, as Wordsworth has it—can also be a reminder of the bonds which restrain our yearnings and which bring even the most athletic dancer back to earth. ANTI—GRAVITY therefore proposes a spectacular meeting between stolid earthbound bodies and evanescent and elusory vapours. The work also addresses more complicated histories of representation, and not only in the context of classical dance. Ho Tzu Nyen, a Singapore-based artist who has worked extensively in video, photography and performance, has a special interest in art history, representation and the construction of culture, and his work often dwells on the movement of symbols and myths across cultures and through time. He is fascinated in particular by instabilities, uncertainties and unlikely transformations revealed in these shifts. It is not, however, the first time he has made a work about clouds. In 2011 he created a multichannel video installation called The Cloud of Unknowing, recently acquired for the Guggenheim collection (see an excerpt). In a series of vignettes recorded at a derelict apartment building in Singapore, he explored the representation of clouds in art and culture around the world. Now he is returning to the subject. As groundwork for the creation of ANTI—GRAVITY, Ho provided 30 pages of notes on cloud iconography in art to van Dijk and her team. According to van Dijk, the eight sections of these notes will form eight distinct sections in the dance. And clouds have just as complex a history in dance and theatre as they do in painting. Fogs, fumes, mists and hazinesses of all kind have long been standard theatrical effects. The Elizabethans used different-coloured smoke to suggest the approach of thaumaturgical powers. Seventeenth-century Rome had a device called “the heavenly machine” which was used to create cloud scenes for angelic hosts. And designers for Romantic ballets in the 19th century invented misty Rhineland valleys and vaporous dreamscapes using scrims and painted backdrops to suggest insubstantiality and mystery. Anouk van Dijk herself frequently uses atmospheric effects. 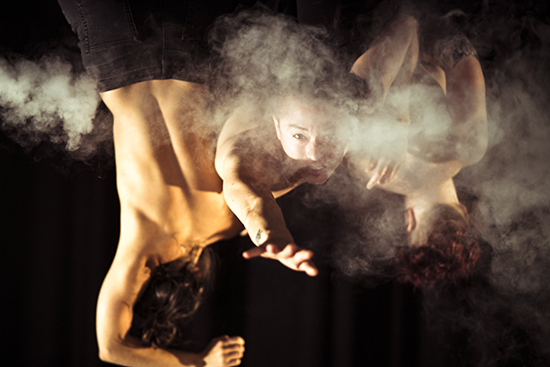 The first work she presented as Artistic Director of Chunky Move, An Act of Now (2012), began with a man in a trench coat standing before a glass-walled house, smoke billowing around him as if he were standing on a fumarole. On a much smaller scale, her most recent work, Lucid (2016), experimented with dancers, cigarette smoke and video cameras. For ANTI—GRAVITY, however, she’s investigating a broader range of haze effects. The Cloud of Unknowing was partly inspired by a semiotic history of clouds in Renaissance and Baroque painting, and the way in which clouds signalled an interruption of the closed, rectilinear space of 15th century perspectival painting. “Clouds in the Western iconography—we kind of always associate it with transcendence or the presence of the divine, at least in the early Renaissance,” says Ho. But how do you inscribe emptiness in a theatre? What’s the performative analogue of nothingness? “That’s something that we’re hoping to find in this session,” says Ho. 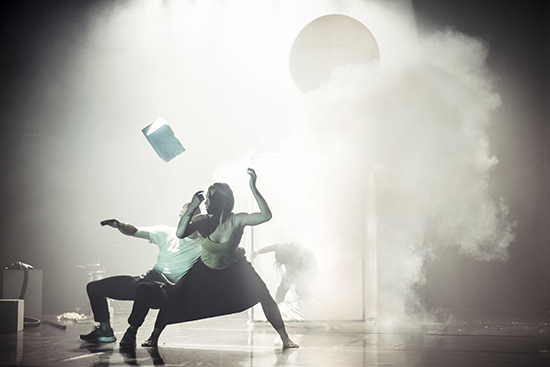 The six dancers in ANTI—GRAVITY include Chunky Move regulars Tara Jade Samaya and Niharika Senapati, as well as Luigi Vescio who had a role in both Depth of Field (2015) and Rule of Thirds (2016). There are also three new dancers joining the team: James Batchelor, Marlo Benjamin and Sarah Ronnie Bruce. Ho Tzu Nyen’s Cloud of Unknowing is named after a 14th century monastic text that encourages young students of the divine to acknowledge and accept as inevitable the feelings of doubt that cling like a shadow to the contemplation of God. An immersion in unknowing is also crucial to Ho’s creative practice, and he admits that he is still not sure how he should define his role in this current project. Is this a new kind of creative function: the miasmatic artist?